Last week we discovered some of the magic behind how Disney celebrates Christmas at their resorts, but today we are going to get a taste of what you can expect in the Walt Disney World theme parks. Expect big things like larger than life trees and decorations, brand new seasonal merchandise, and special events, shows, and parades that will knock your cheesy Christmas-printed socks off! Not unlike the resorts, a lot of it just can’t be accurately described in an amateur blog such as mine. You just have to be there to experience the full extent of it. 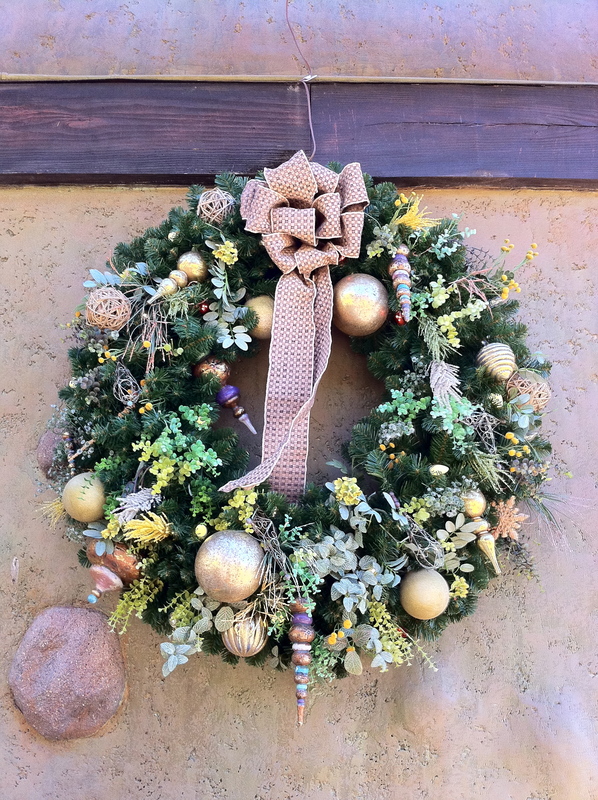 However, today I am going to tell you, based on our humble one-time Christmas visit, the Elrod’s top picks of what to see and/or do in each park during the holiday season. Although I hear that the Jingle Jungle Parade is tons of fun, the day that we visited Animal Kingdom during Christmastime was a day that we were park hopping, so we didn’t have it in the schedule to stay for the parade. Maybe next time. 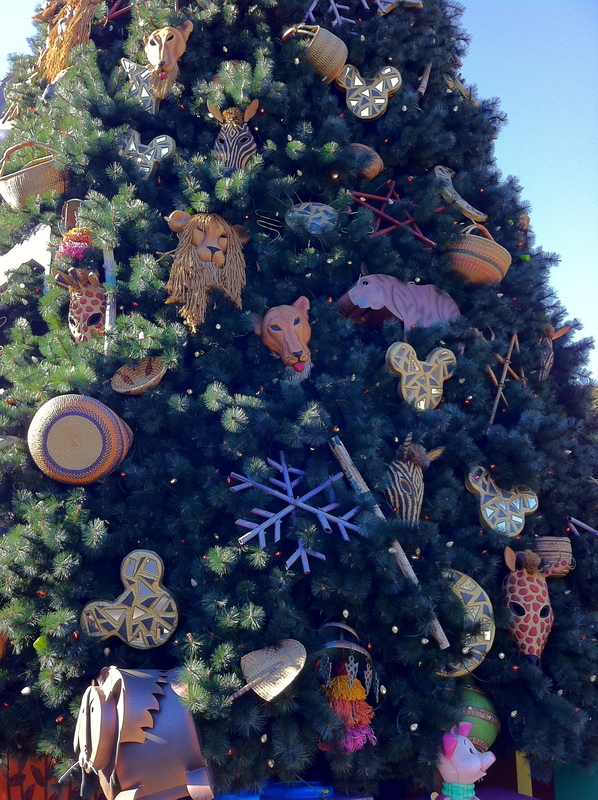 My favorite thing about Animal Kingdom during the holidays was the uniquely African influenced decorations. They were so unlike all of the other decorations throughout Disney property. They weren’t in-your-face red and green, peppermint stripped, or Santa-clad. Instead they were earthy and natural, yet still so beautiful. 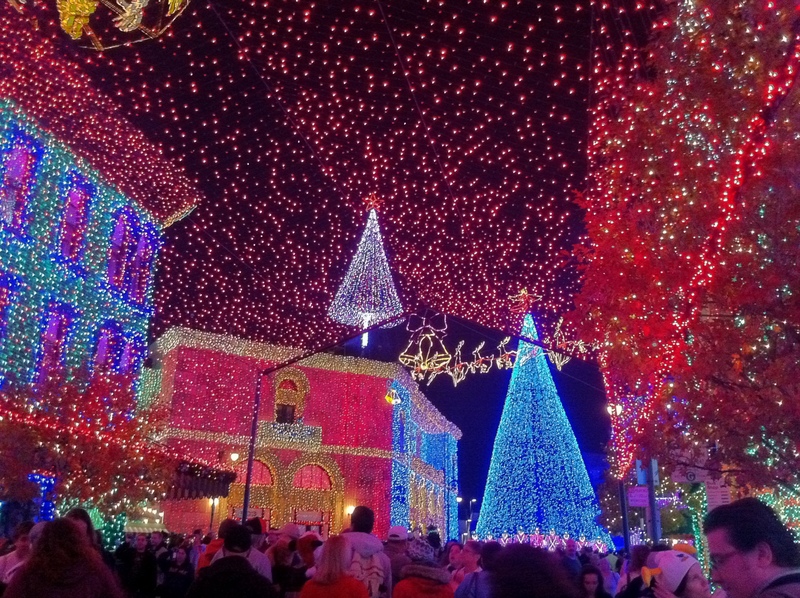 I would love to decorate our house like that one Christmas. But don’t forget to pick up jalapeno cheese stuffed pretzel while you are enjoying the decor. The Elrods never miss a chance at that delicious snack option! 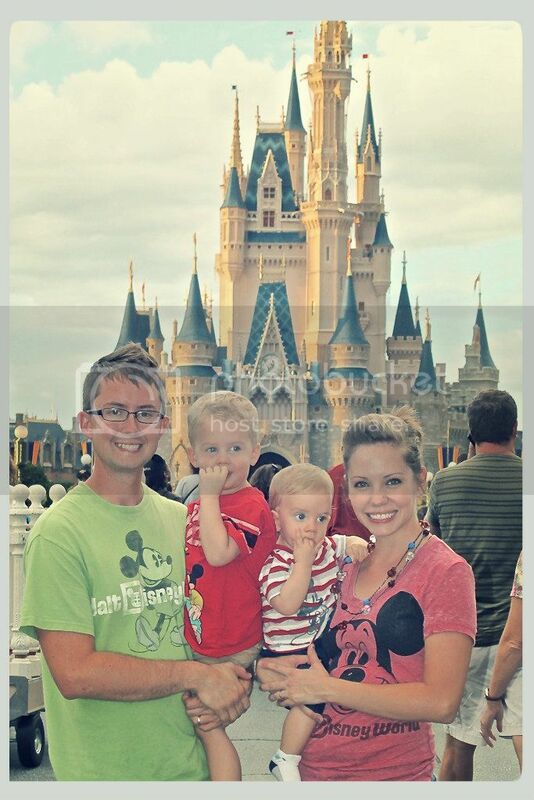 We loved EPCOT at Christmas! It was decorated up beautifully as well, but our favorite thing was getting to see how all of the other countries around the world celebrate the holiday season! 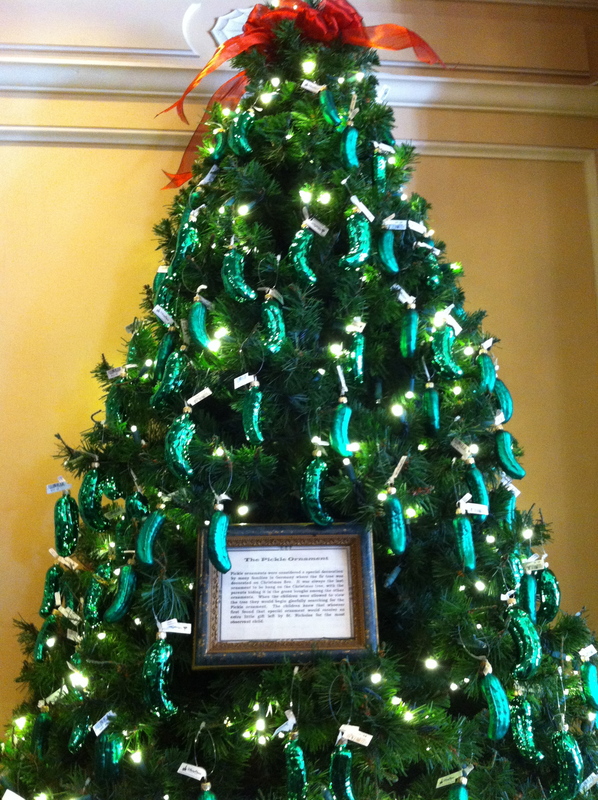 Like, who new the story behind the German pickle ornament? I didn’t! Or that in Canada, they call the man that we know as Santa, Papa Noel. Also, each evening EPCOT hosts the Candlelight Processional. This amazing special event takes place in the America Showcase where each night a celebrity narrates the true story of Christmas accompanied by a 50 piece orchestra and choir. Admission is free but limited, so if you wish, you can purchase the dinner package that will include seating, a meal, and a special viewing area for the Illuminations Firework Display that night. In the eyes of the Elrods, Hollywood Studios seemed to be the least dolled-up park at Christmastime…until you got to the Streets of America, that is. On the Streets of America, the Osborne Family Spectacle of Dancing Lights takes place nightly during the yuletide season. I have home videos of this jaw-dropping show, but I don’t want to show them to you because they come nowhere near doing it justice. The building facades of the Streets of America are covered inch by inch in different colored lights. At dusk each night the lights flash and “dance” to merry Christmas music as snow flurries around your head. It is an amazing thing to experience, indeed, and I implore you to make an effort to see it if you haven’t already. It is definitely the number one thing to do at Hollywood Studios at Christmastime! Mickey’s Very Merry Christmas Party all the way. The park is dressed beautifully for the season, but you just can’t go to Walt Disney World at the holidays and not go to the Christmas Party. Enough said. Well I hope you are having a great week so far. Christmas in July is flying by! Come back next week for Elrod WDW tips on the best times to visit and 2011 dates of special events! It all looks so beautiful! 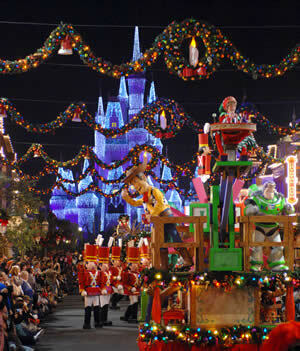 I would love to be able to plan a trip to Disney during the Christmas season – it’s my favorite time of year!